Fundraiser by Magnus Torén : Henry Miller Library Had to Close? Henry Miller Library Had to Close? What? Really? Really!! No more film, music, books, poetry, art and music! What Would Henry Do? Open a new place, of course!…Please read on! Mudslides. Wildfires. Falling trees. Collapsing highways. No one said living and working in Big Sur would be easy. But the current situation is unprecedented. 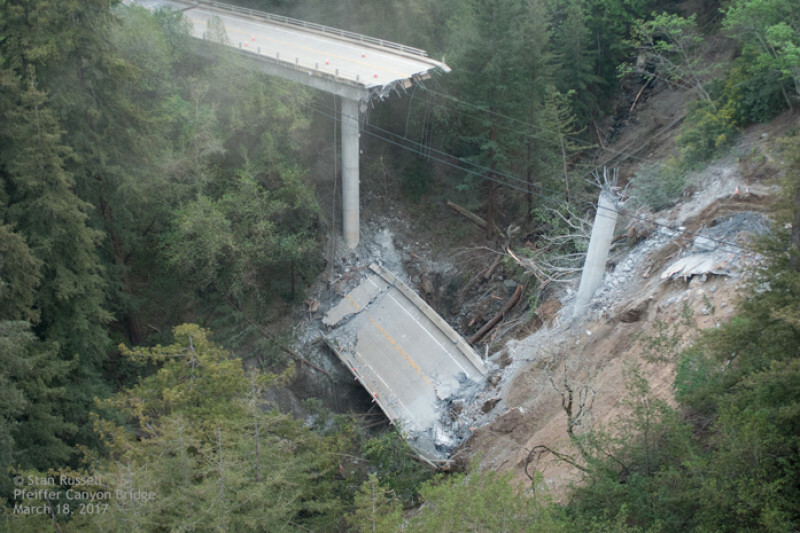 The Pfeiffer Canyon Bridge is now a heap of rubble. It was demolished on March 20th due to structural damage caused by relentless winter rains. The Henry Miller Library has been closed since mid-February. It has now re-opened Thursday - Sunday, but to far less traffic since vehicle access will remain cut off from the north. The loss of donations, book sales, plus event and rental income has already far exceeded $80,000. This income is cut off until a new bridge is in place. We're not sitting idle on one side of the bridge we're DOING something to help ourselves and the community as a whole but we need your help! On May 28, 2017 we opened the doors of the Henry Miller Library in the Barnyard— a new gallery/bookstore in the Barnyard shopping village off Rio Rd. in Carmel, California! The gallery has brought Big Sur to "town." Books, live music, movies, talks—everything you've come to love about the Library but can't enjoy due to the whims of Mother Nature. A new location advances the Library's mission of promoting the arts during a time when we could all use more of it. Henry would agree—and we hope you do too! The cost of ‘moving to town’ is not huge but with rent, exhibit materials, bookshelves, new inventory, framing, utilities, some remodeling, lighting… etc. it adds to our already serious loss. We need help to reverse the drain on our resources! Your donation to the Library - a 501 (c) 3 Non Profit Arts Organization - is tax-deductible. Thank you for your support and hope to see you soon...at the Barnyard! PLEASE SHARE THIS WITH AS MANY YOU CAN! PS. Please, do anything and everything you can to get the word out about our GoFundMe Campaign (share it on Facebook, forward this e-mail, send pigeons!) and by allmeans send us your ideas! Check out KSBW Action News' story on the new location at the Barnyard!! We've said it before, and we'll say it again: We're putting your donations to work. If you've yet to make a donation, consider making one! If you've made one, consider adding to it! Either/or, do tell your friends! And thanks!! GOOD TIMES SANTA CRUZ GIVES (OR IS IT “SHOWS?”) THE HML AT THE BARNYARD SOME LOVE! 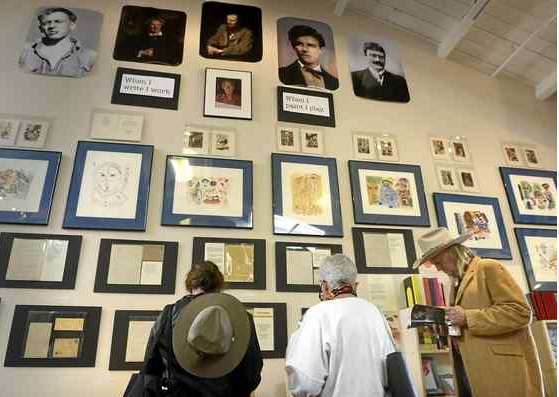 “In Carmel, Miller’s letters and photographs adorn the Barnyard’s walls. 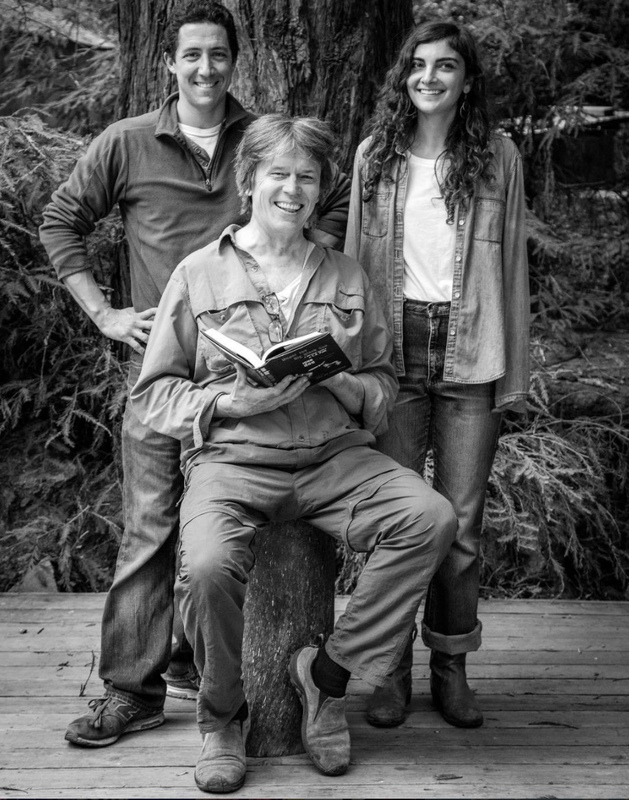 Dedicated supporters of the library ensured the unveiling went off with “overwhelming positivity,” says Toren, and high attendance has persisted throughout the week thanks to a movie screening on the reintroduction of California condors to Big Sur. If you've yet to make a donation, consider making one! If you've made one, consider adding to it! Either/or, do tell your friends! Gino and Allegro Pizza, Big Sur Vineyards, Lagunitas Brewery, The whole crew at the Barnyard, McNamee Construction, Alisa Fineman and Kimball Hurd, Carolyn Kleefeld, Martin Sheers, Maria Teutsch, Elliot Ruchowitz-Roberts,The Range of Light Wilderness, Studio Carver, Elsa Rivera, Rich Brimer, Don Dickman, Noel Mapstead, Tim Bills, Sunny Smith, DJ Lindsay Napoli, Andrew Byars, Jessica Healy, Dasha Bulatov, Taylor Gersbach, Peery Sloan, Ruby and Drew, Jaimeson Berkheimer, Tom Lis, and of course, everyone who came out!! We're open now, so come say hi! 3728 The Barnyard, Suite G-23 in Carmel. Open every day except Tues. from 12 - 8 pm. Stay in close touch - we’ll develop this place together! Check it out! Magnus riffs on the new Henry Miller Library location at the Barnyard - and pulls out some rare local art! Your support is making all of this happen! We'll see you at our Grand Opening Party on Sunday, May 28th from 2 - 10 pm. 3728 The Barnyard, Suite G-23, Carmel. Can you have a movable fundraiser? In San Fran and in LA. People who pass through always stop there and should support. It's a most beautiful and peaceful place. Can I share this video in one of my articles about traveling on Highway 1? How cool that someone donated $10,000!! Had you considered offering books, etc for sale online? How about doing an auction with authors, agents, and editors who can donate signed books, critiques and such? That has worked for many other causes like this! Then you can set it up and we can all share on social media! On that "Movable Fundraiser" note.... What about a rolling bookstore? With rolling arts/music/discussions...all the goodness that HML shares, but now, it's On The Road? I'll bet cafes all up and down the coast would be jumping at the opportunity to host events in the name of Henry Miller and the library's mission. This could reach more people, and cost less rent if you can find an affordable trailer/rv/bus. Good luck. Longtime Miller fan.